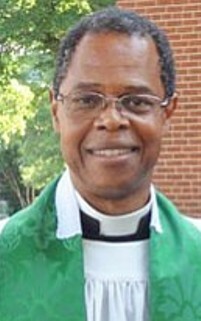 Thompson previously served for eight and a half years as the rector of the Episcopal Church of the Holy Covenant in Baltimore City and immediately prior to St. Anne’s, he served as interim rector of Grace Memorial Episcopal Church in Darlington, Maryland. Thompson is St. Anne’s first African-American clergy member in more than 100 years. Before becoming a priest, Dion Thompson enjoyed a twenty-year career in journalism, working for The Baltimore Sun, The Miami Herald and The Hartford Courant. In Hartford, he started as a night police reporter and went on to cover a variety of beats, including the Connecticut state prison system, the neighborhoods of Little Haiti and Liberty City in Miami, and the state legislature in Maryland. Born in Los Angeles, California, he holds a B.A. in English from California State University, Long Beach and an M.F.A. in Professional Writing and Publishing from the University of Southern California. His novel, “Walk Like A Natural Man,” was published in 2003. Recently, he has been a resident scholar at the Collegeville Institute and written articles for Episcopal publications.